do you see that? 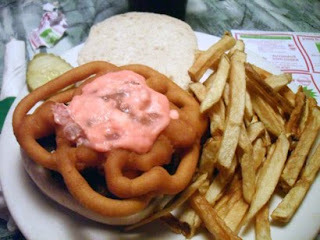 that is a burger with a funnel cake on top of it. and on top of the funnel cake? raspberry cream cheese. yeah, that's right. I ate that for dinner. it was probably one of the most delicious things I have ever eaten in my entire life. seriously, you should go to California Bar and Grill right now and order one of these things. I don't remember what it is called, but it shouldn't be too hard to find on the menu. I stopped by your blog today. I can't begin to imagine what something like that would taste like.